Wonderful Stuff, good solid Vegetarian food. Quiet loud atmosphere, at lunchtime often to busy. One of the best coffee in town. 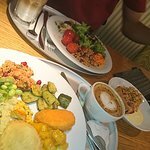 All the family likes going to this self service vegetarian restaurant in the heart of Winterthur.The buffet is fresh, is constantly being replenished, and every time we go they seem to have added new dishes. I'm no vegetarian but I love this place. Try the local bio beer as well, it's fantastic. 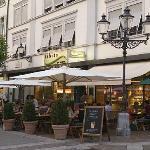 After experiencing this chains other Zürich restaurant we liked it so much we went again the next night . Not cheap in English standards but average by Swiss. I'm not a veggie but this place could convert me . Fresh and very tasty . Only not giving it give stars down to the price. Would love to see this chain develop in the UK . Thank you so much for this feedback as well. 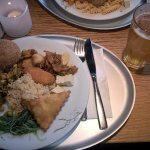 How nice that you liked your meal so much you recognized tibits and went another time! 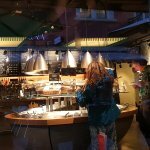 We stop at Tibits after a long walk around the old city. 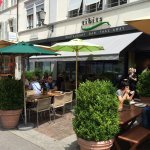 Nice alfresco lunch in Winterthur paired with a glass of wine! Fresh vegetarian buffet in the middle of the pedestrian area! What is there not to love? !